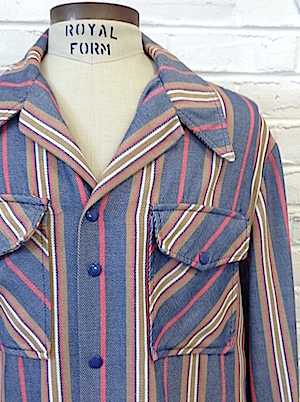 Home > Men's Vintage Shirts > Men's Vintage Shirts: 1970s > (XL) Mens Vintage 70s Disco Shirt! Blue, White, Tan & Coral Striped Denim! 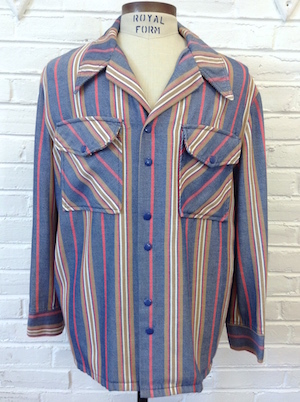 Mens vintage 1970s disco shirt This groovy shirt comes in blue, white, coral and tan vertical striped denim! Has a super wide & pointy disco era collar. Closes in the front with shiny blue snaps with two more on each cuff. Two patch pockets on the chest with flap and snap closures. Shirt has a straight hem. No material tag, but feels like cotton.